Diwali – The festival of Lights means two things –New Clothes and Sweets. How is it possible for all to enjoy Sweets during Diwali when 10 % of the population is estimated to be Diabetic ? Dezire Goodlife offers a range of sweets made of natural sweetener Levulose which has the sweetness profile of Apples & is approved by leading Diabetologists. Dezire Natural sweets made from Levulose are as tasty as sweets made with sugar. Dezire sweets is all the more appreciated as there is no bitter after taste unlike sweets made with artificial sweeteners. Dezire sweets are healthier option and free from any side effects. If you look at the Glycemic index an important parameter of food for health Conscious & Diabetics, Levulose has a glycemic index as low as 19 as compared to 68 of sugar. Even the sweetness profile is almost 1.7 times than sugar resulting in usage of just half the quantity as compared to sugar hence reducing even the calorific value. Dezire offers a wide variety of Indian sweets like Badam Halwa, Kaju katli, Badam Katli, Lados, Jhangri , Mysure Pa, Milk Burfis & Gulab Jamun Tins etc at the company showrooms in Burkitt Road, T.Nagar & Shanthi Colony in Anna Nagar. Our products are also available at all the Departmental Stores of Nilgiris, Nuts & Spices, Brown Tree, Wait Rose & many more Departmental stores across the state. Dezire products are ideal for gifting to the health conscious & Diabetics. 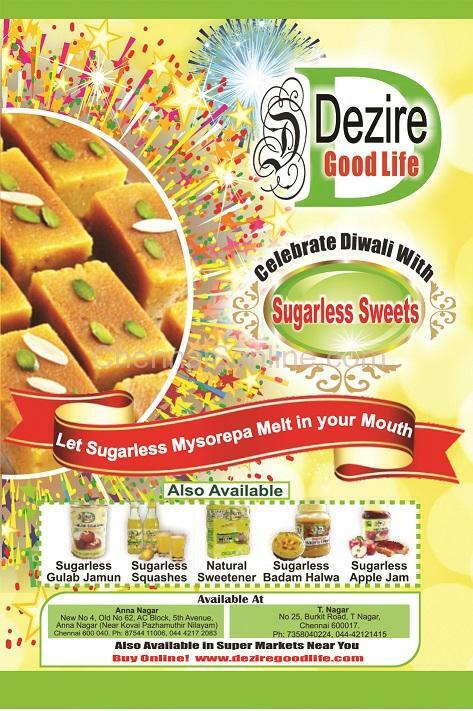 Try Dezire products during this Diwali season & Enjoy sweets without Guilt.